For the past few vintages, the Terre à Terre label of Xavier Bizot and wife Lucy Croser has been inching towards a truly game-changing wine. Something that will put the brand on the map. Make a splash. Go up a level. You get my cliché drift. 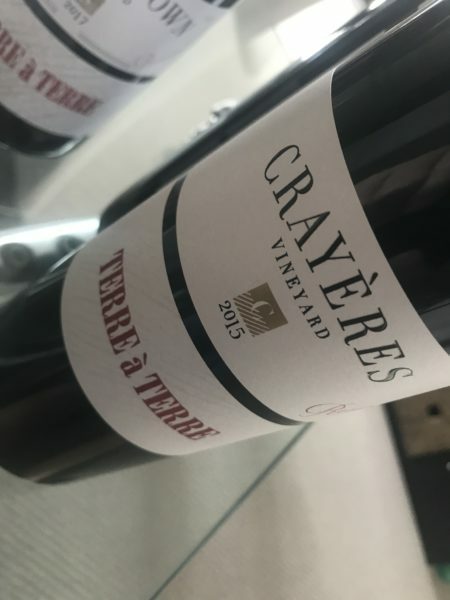 And with this Terre à Terre Crayères Vineyard Reserve 2015, Team Terre à Terre has delivered! A big price jump, but a quality jump for this iteration too. Now a blend of 60% Cabernet Sauvignon, 20% Shiraz and 20% Cabernet Franc (which seems the right combo) from the close-planted Crayéres Vineyard in Wrattonbully. Aged in 75% new oak for six months and then in a 5-year-old foudre for 15 months before bottling unfined and unfiltered. What sets this vintage apart is the polish – that textural generosity and the silk of the tannins is next level. Think modern right bank Bordeaux, which is about right in the context. Smooth and absolutely perfectly contained, the flavours all black pastille, dark berries, fine, coffeed oak and silky tannins. I’ve been critical of some releases of the Terra à Terre Cabernet before due to alcohol warmth, but this ’15 didn’t seem to show it at all. A win. Ultimately, this is a massive standout – the containment and even-handed elegance is delightful. There’s this core of savoury black pastille fruit and finely finessed tannins. It’s a delight that will only get better. Best drinking: Good now, and will be alive in twenty years. 18.7/20, 95/100. 14.4%, $110. Would I buy it? I’d like a bottle in the cellar for sure, but its now out of my price range.